KTemoc Konsiders ........: Frogology thrives in 'New Malaysia"
Our people generally have short memories. There was a time when many of us were outraged at elected representatives from any one of DAP, PKR, PAS and PBS for defecting to the Barisan Nasional. All kinds of nasty names were hurled at them, with insinuations that these unprincipled and dishonourable politicians were paid to be political frogs, all of whom contributed greatly to the collapse of two state governments. In 1994, the Parti Bersatu Sabah (PBS) – which pulled out from the Barisan in 1990 – won the state elections with a slim majority of 25 seats against Barisan’s 23. But the fourth-term PBS government lasted only about two weeks before it was ousted following defections of some of its state assemblymen. This was unprecedented in Malaysia, and it swung the doors wide open for Umno to set up shop in Sabah, taking with it its race and religious-style politics. Then, in 2009, when the Pakatan Rakyat (PR) formed the state government, three of its state assemblymen defected to Barisan, causing the PR government to collapse. Naturally, there was plenty of resentment at what was viewed as classic treachery and immorality. Prior to the defections, PR had 32 representatives while Barisan 27. The ship-hopping meant that the state then had 28 PR representatives, Barisan likewise, and three independent representatives who pledged confidence with Barisan. But the movement began with PR because Barisan’s Nasarudin Hashim decided to cross the floor to join PR. Its leaders then jubilantly claimed more Barisan lawmakers would join in an exodus. Instead, Nasarudin returned to Barisan, accompanied by Deputy Speaker Hee Yit Foong of the DAP, and senior state executive councillors Jamaluddin Mohd Radzi and Osman Jailu of the PKR. A year later, Malim Nawar assemblyman Keshwinder Singh quit the DAP to become a Barisan-friendly independent assemblyman. Many political leaders, who are now Pakatan Harapan figureheads, mouthed off angrily then, but now, have seemingly gone mum at the latest round of camp-switching involving Barisan politicians to PH. Just Google if you want a quick history of who these politicians are and what they said then, and importantly, when they were at the receiving end. That probably explains how although many of us felt cheated and demanded an anti-hopping law be enacted, everything invariably died under a deluge of excuses. Is it surprising that nothing happened? Of course not, because politicians have always known that defections make for handy tools. For them, it’s all about power, and how the end justifies the means, so the people’s mandate counts for little. It could seem a betrayal of our trust, but defections will likely be justified as freedom of association, and something perfectly natural. In 1978, DAP supremo Lim Kit Siang attempted to move a motion in the Dewan Rakyat to introduce a Private Member’s Bill, the Members of Parliament (Prevention of Defection) Act, which would require an MP to vacate his seat within 30 days and have a by-election upon his resignation or expulsion from the party on whose ticket he was originally elected. When Lim was queried by readers of a newspaper about the effective measures that could be taken to prevent such opportunistic political betrayal of the people’s confidence, he replied saying the best way was for the enactment of such a law. Following Datuk Mustapa Mohamed’s defection to Parti Pribumi Bersatu Malaysia (Bersatu), DAP chairman Tan Kok Wai voiced the party’s discontent, saying it was “unhealthy” for PH component parties, including his own, to accept former Umno MPs. Tan’s comment came two days after Umno veteran and Jeli MP, Mustapa Mohamed, joined the party. Now, talk is rife of a massive switch over of Umno MPs and members into Bersatu, with the party’s supreme council member, Datuk A. Kadir Jasin, conceding to a possibility of up to 40 MPs being involved in the mass exodus. He revealed that the 40 Umno MPs met with Bersatu chairman Tun Dr Mahathir Mohamad and president Tan Sri Muhyiddin Yassin. What happens next could well see PKR and Bersatu competing for the entry of elected representatives to alter the equation in PH. 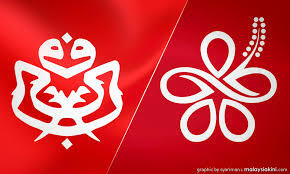 With Tok Pa now in Bersatu, its numbers have gone up to 13 while PKR has 48, DAP 42, Amanah 11 and Warisan 8. If indeed 40 MPs were to join Bersatu, the total could swell to 53, making it the biggest component party in PH. And assuming there are disgruntled PKR MPs who leave the party after its internal elections, it could put Datuk Seri Anwar Ibrahim in an uncomfortable position, even if these turncoats don’t join Bersatu and remain independents. 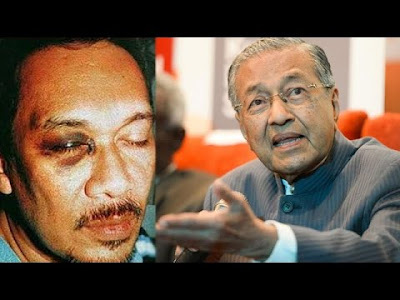 will anwar get another black eye? It doesn’t help that the Setiawangsa Bersatu division is rooting for Dr Mahathir to complete his five-year term as Prime Minister, ending next general election. The Setiawangsa division, headed by Dr Mahathir’s political secretary Zahid Md Arip, passed the proposal unanimously last week. The remarks by Kadir and the motion by Setiawangsa Bersatu have spooked many supporters of Anwar and PKR, and they don’t find this funny at all, especially during the Halloween. Certainly, supporters of Anwar now expect him to make a similar move to get Umno MPs, or those from Gabungan Bersatu Sabah, to join PKR to “neutralise” Bersatu. The names of several Sabahan MPs have been bandied. The Prime Minister has repeatedly said he would pass the baton to Anwar, with the latter insisting the PM should be given time and space to govern effectively to steer the country back on track. The PKR leader said this was the reason he refuses to specify a time frame for him to succeed Dr Mahathir as the next prime minister. “Some people see this transition as fragile, but I don’t. The fragility will come about only if there are major battles waged between me and Mahathir, but I have made it very clear. 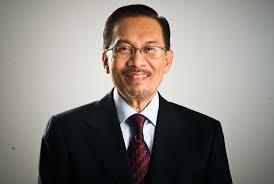 Number one, he is the Prime Minister, and number two, I refuse to give a time frame,” Anwar said. It’s obvious Anwar doesn’t want to appear a man in a hurry, while repeating the same assurances. However, without a time frame and being the president of the biggest component party in PH (so far), the partnership in PH will be tested. No one can deny that the three leaders – Dr Mahathir, Anwar and Lim Kit Siang, and to some extent, Mohamed Sabu, came together with a single aim – to topple Datuk Seri Najib Tun Razak and the Barisan. 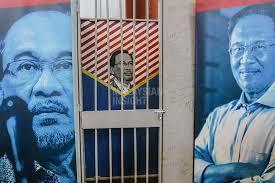 However, none of them had any real love for Dr Mahathir, but they knew he was key to winning the general election. 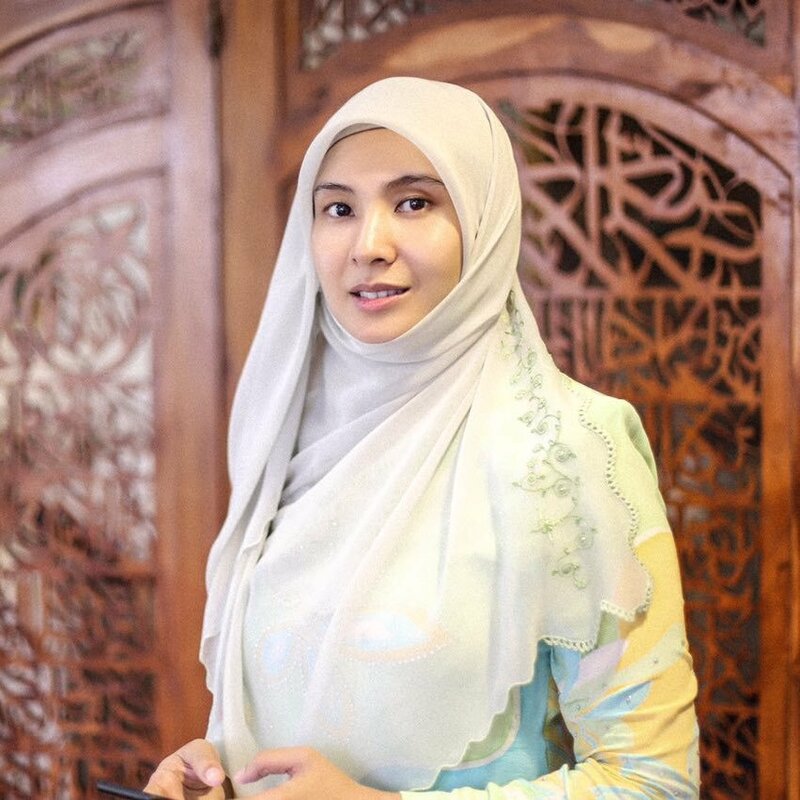 Let’s not forget that at one point, Dr Mahathir came close to walking out of the electoral pact, and Nurul Izzah Anwar flew to London to convince him to stay on amid tensions over PH’s hierarchy. Dr Mahathir and Anwar may have their interpretation of succession, but as with all parties, there will always be over-zealous leaders with their self-interests of ensuring their masters remain in power to allow them to continue enjoying the powers and privileges of being in government. And on the flipside, others can’t wait for their masters to be installed. The two must now manage the push and pull because once the floodgates open, they won’t be able to stop the one-upmanship for more members, especially elected representatives who could boost their standing. It’s beside the point whether Dr Mahathir or Anwar genuinely trust each other, the reality is, only either of them can hold the coalition together. But the new government shouldn’t forget the people who put them there for a New Malaysia. If PH leaders can’t respect and uphold this democratic right of the people, then what’s the point in holding elections when all we see is more of the Old Politics? Politicians by nature are hypocrites but those who condemned the other side FIRST for hypocrisy, and then do exactly the same criticised stuff, are the BIGGER hypocrites. It proves my teacher's saying "He who calls someone a (liar, cheat, thief, hypocrite, etc) is the BIGGER (liar, cheat, thief, hypocrite, etc)". 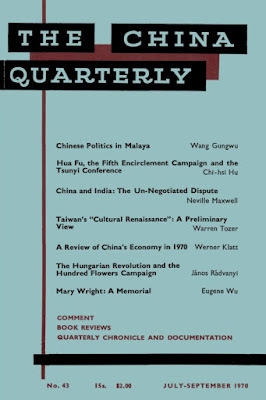 As the author wrote: In 1978, DAP supremo Lim Kit Siang attempted to move a motion in the Dewan Rakyat to introduce a Private Member’s Bill, the Members of Parliament (Prevention of Defection) Act, which would require an MP to vacate his seat within 30 days and have a by-election upon his resignation or expulsion from the party on whose ticket he was originally elected. But today Pakatan is acting "dunno" on this proposed bill. Mahathir is of course the big hypocrite (as he has always been) but Lim KS in remaining mum is now undeniably the Tun's machai. How are the mighty fallen in the midst of the battle! O Kit Siang, thy righteous soul wast slain in thine high places. 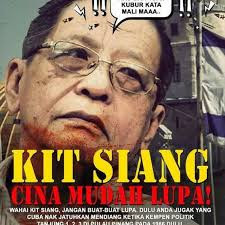 I am distressed for thee, my erstwhile idol, former icon and once-hero, brother Kit Siang. "He who calls someone a (liar, cheat, thief, hypocrite, etc) is the BIGGER (liar, cheat, thief, hypocrite, etc)". Yr teacher could have forgotten to tell u the dominant determinant of the timeline in the above saying! Otherwise, it's just a circular statement of zilch consequences lah! So, in the case of bolihland Machiavellian moves, who started the frogology dance first ler? who start first not relevant, just like we oso buat tak tahu what mahathir did in the past. but still condone it now especially dap/lks show that tis party n their leader is hypo. 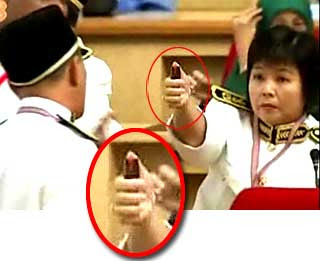 begin tak serupa cakap, n it just proof my point along the years, dap n lks is hypocrite. "who start first not relevant"! Tell that to the manipulating swordsmith lah. & along the way strongly remind yrself too! U might buat tak tau what mamak did in the past BUT definitely not the others. So DONT ever grouped us into yr cozy tempurung. Politicians, by nature, r situational animals all over the world. Acts of their hypocrisy r the NORM. The ONLY judging criteria is WHO benefit the MOST by their acts - the country or they themselves. Like it or not, the humanity PD at the current stage of evolution dictate that inherent self entitlement along the calls of their duty. so who benefit from the 40 thief that gonna join mahathir, pakatan or the people? dun run in circles. So much lacking of the big picture! If the 40 thieves CAN be 'utilized' by mamak to achieve his own final solution for the melayu (thus bolihland) before he meets his maker, then all bolihlanders WOULD benefit. 浴火重生 is what M'sia needs now. & mamak is the ONLY one who got the teloq to implement the tough but necessary strikes! Unless u believe in mamak building his dynasty lah. & manmanlai can do what mamak wouldn't do (dream on lah - this talker has too many personal baggages to do good for M'sia). In fact, in most established democracies, there is no law , as such, against frogging. 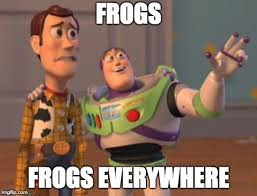 The main deterrent is just that the political environment is inhospitable to frogs. Voters in those countries do not take kindly to frogs. Representatives who find that they strongly disagree with their party line will usually resign or become independents. Is it not pengkhianat, as most people vote for the party not the candidate? Some years back, there was a Conservative MP in the UK who resigned from the Conservative Party to join UKIP during his term as MP. Under UK electoral law, he had to vacate his seat, a byelection was called and he had to contest for the seat again, this time under a UKIP ticket. In this case, he won and re-occupied his seat, now as a UKIP MP whom his constituents voted for. Most people vote for the party, not the candidate, so it is only fair on the constituents that if an elected representative switches parties, he or she must vacate the seat, a byelection must be called and if he or she wants to, the former elected representative must re-contest the seat to try and win it back under his or her new party. Malaysia must enact a similar law to be fair to the electorate. Freedom of association eh??? 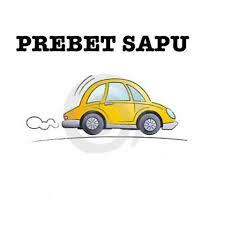 The hell with the article of the constitution permitting katak. As mentioned before, the law must distinguish wakil rakyat from ordinary citizens. Pengkhianat!